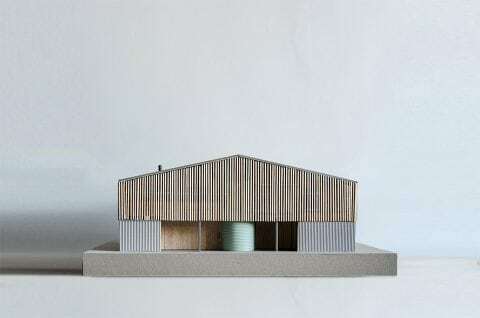 31/44 was approached by two product designers to design their new family home within an existing steel-frame metal-clad agricultural barn in rural Norfolk. 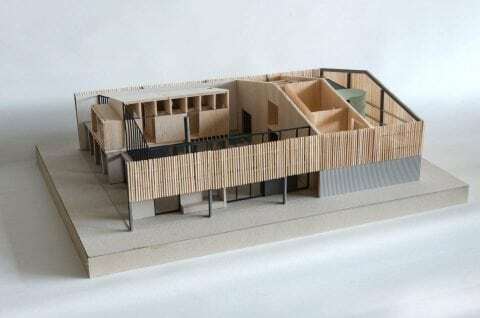 Planning restrictions stated that the dwelling had to be housed entirely within the 450m2 shed and that the existing structure had to be retained. 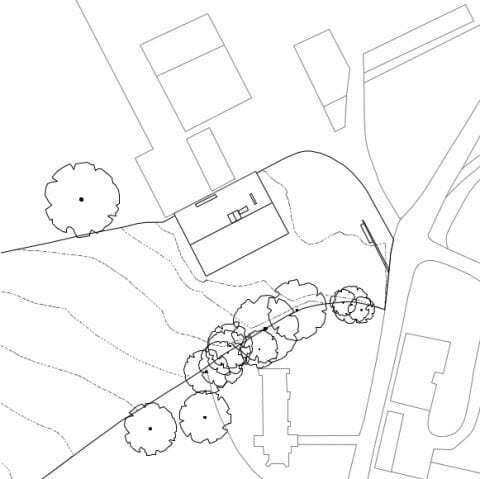 Our proposal is also to remain subservient to the adjacent parish church. 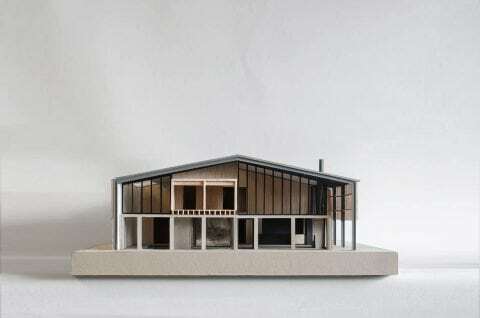 The proposal presents a series of calm facades to the surrounds, particularly on the approach from the road. 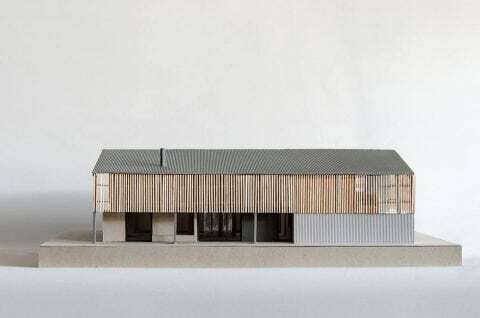 An upper-level screen of timber louvres wraps around three sides of the building, cloaking the house within and retaining the look of an agricultural building. 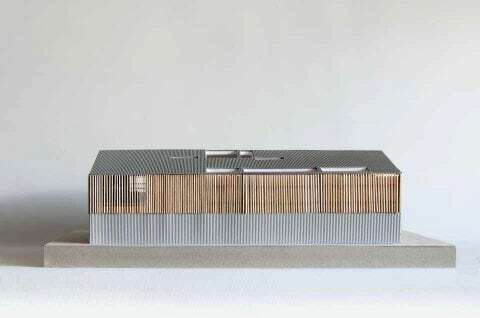 At low level large-profile corrugated metal sheet wraps the external faces of the ground floor. A ‘silo’ staircase visible through and beneath the louvres evokes the sense of a place of agriculture and industry. 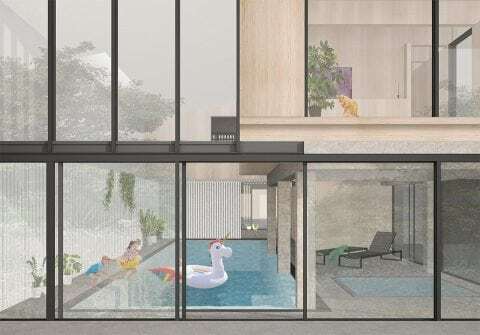 Inside the house a ‘found’ single-storey concrete structure of columns and beams helps to create a division between the large double-height living space and the swimming pool, while timber volumes define smaller, more intimate spaces for domestic living. A bridge links these main volumes. 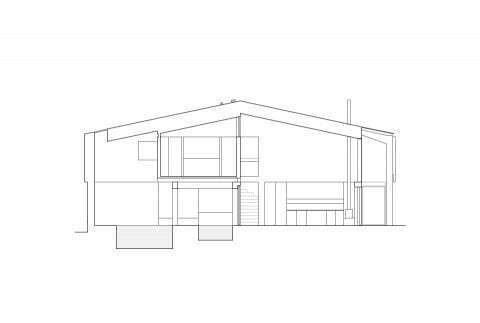 The ‘found’ structure adopts the language of agricultural plant – with the robust concrete frame supporting the fine timber volumes above. 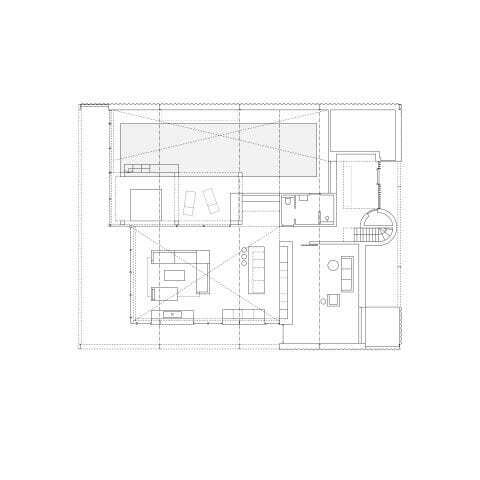 The architecture captures the memory of the building as one of process and practical purpose while accommodating the new domestic use with an additional level of comfort and refinement inlaid into the utilitarian structures. 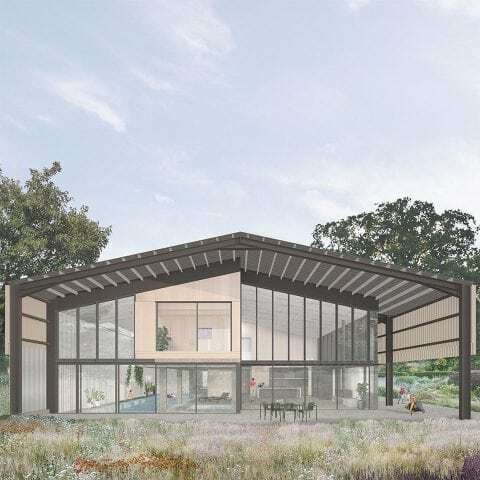 Three sides of the house are set in from the perimeter of the barn edge, creating pocket gardens and transitional spaces that are external but sheltered by the main roof. 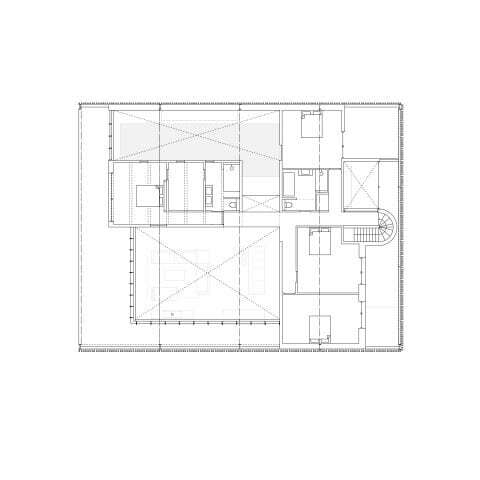 The transitional spaces open into an extensive, partly productive, series of gardens. 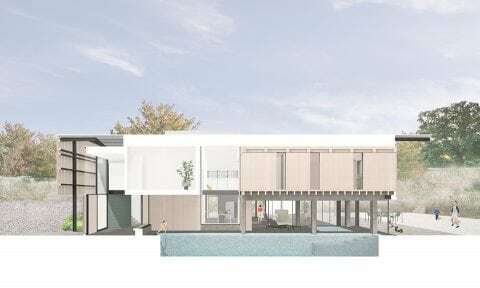 While the proposal is quiet to the front elevation and towards the immediate neighbours, the rear of the house opens up to the surrounding countryside. 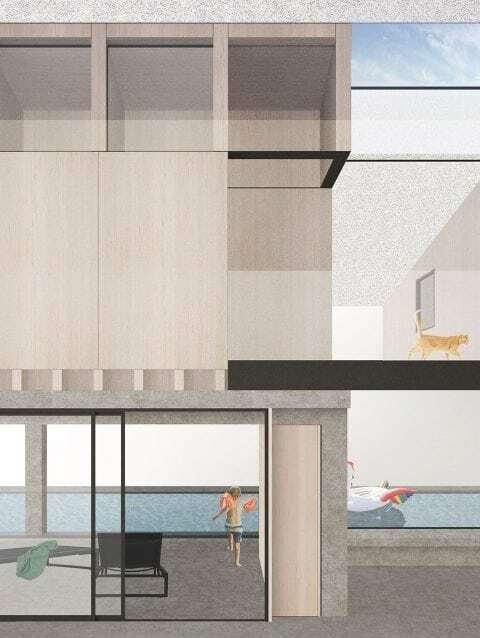 Here the louvred screen is peeled away to reveal the double-height curtain-walling behind, allowing uninterrupted views across the extensive setting – with the tended gardens adjacent to the house flowing into the wider meadow landscape. 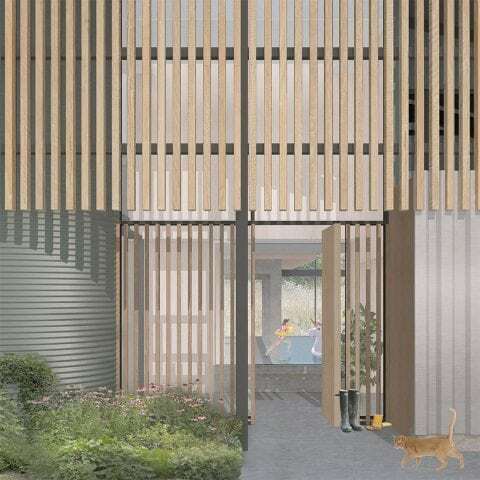 Church Farm is due to start on site in Autumn 2018.